In addition to the horrific shooting in Orlando this past weekend, Meyers talked about Democratic Senator Chris Murphy’s 14-plus-hour filibuster. He did it in order to secure more support for legislation banning gun sales to anyone on the terrorist watch list, and to require background checks at gun shows and for internet sales. Meyers played clips of some on the other side making arguments, including challengin Hillary Clinton’s support of gun control while having armed guards. 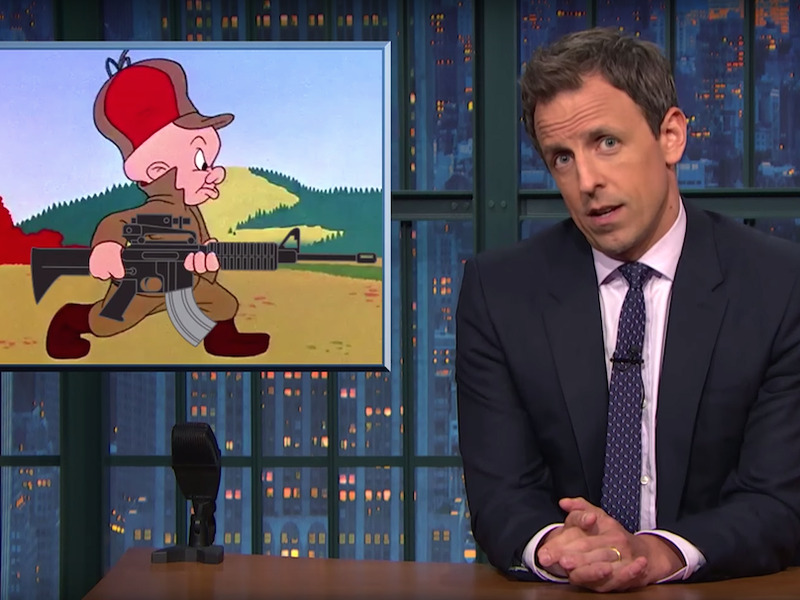 Meyers then played a video in which a TV reporter bought an AR-15 rifle, similar to the type that was used in the Orlando shooting, from a shop in just seven minutes. In another news story, a reporter spoke to private gun seller at a gun show and asked what would be required to purchase a gun. The seller said a state ID. But in the absence of a state ID, the reporter asked if he would sell a gun to a person who had an honest face. The seller said yes. To end the segment, Meyers explained why he thinks stricter gun legislation is necessary.